Made from sweet potato noodles and stirfried in sesame oil, japchae is a Korean dish most often served atparties and special occasions. It is usually a side dish served on abed of rice, though it can also be a main meal. 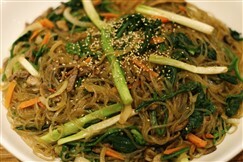 Japchae also has various vegetableadded to the dish, typically mushrooms, onions, spinach, carrots andonions. These are usually sliced thinly and stir fried with thenoodles. 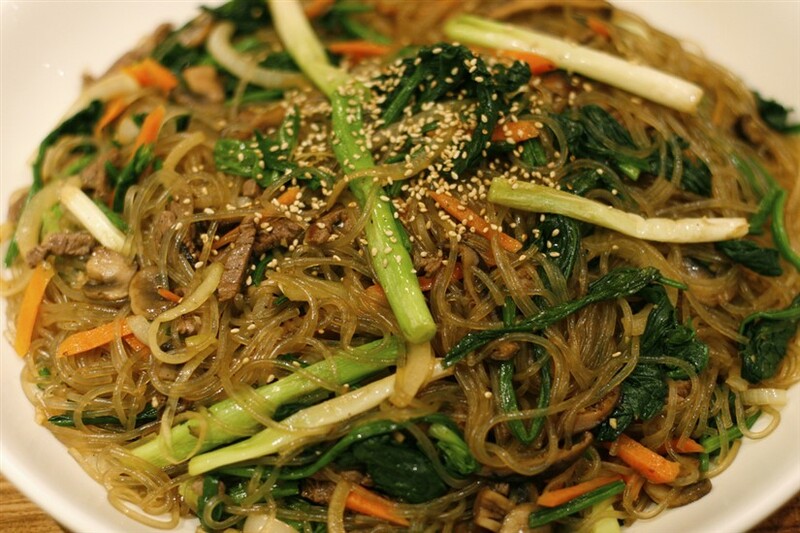 Unlike many other Korean meals, japchae is on the sweeterside, rather than spicy. Flavored with soy sauce and sugar, it can beserved either hot or cold, garnished with sesame seeds and a smallamount of chili. 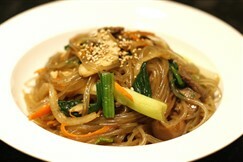 Japchae is another product of theJoseon Dynasty in Korea, made for King Gwanghaegun in the early 17thcentury. Instead of noodles, it was originally made with vegetables,such as sliced cucumber and mushrooms. The name japchae literallymeans “a mixture of vegetables.” These days, vermicelli noodlesmade from the starch of sweet potatoes are used.